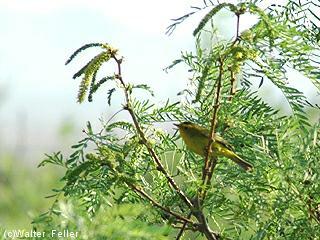 The Wilson's Warbler, (Wilsonia pusilla), is a New World warbler. It breeds in northern North America across Canada and south through the western USA. It is migratory, wintering in Central America. 12 cm long. It has a plain green-brown back and yellow underparts. The male has a small black cap. These birds feed on insects, often caught by flycatching.